Discussion in 'PC Hardware, Software and Displays' started by Kaotik, Aug 28, 2018. NVIDIA has officially adopted Adaptive-sync. They've tested 400 displays so far, of which 12 got official "G-sync compatible" stamp aka works automatically, on the rest user can manually enable support and see how it goes. NVIDIA claims they're going to test every single Adaptive-sync (FreeSync) display out there to grant more stamps if applicable. Alexko, Lightman, Silent_Buddha and 2 others like this. Alexko, BRiT and Lightman like this. Kyyla, ToTTenTranz, BRiT and 1 other person like this. Oh wow, thank you for this. Damn, now I wish the Ryzen 1600x had integrated graphics so I could try this out. Still not great to not have adaptive sync natively supported on NV GPUs and it would mean choosing a CPU with integrated graphics, but at least it is something. Now, I wonder how long it'll take NV to be spiteful and attempt to shut this down. Can nvidia or AMD disable this in future driver revisions? If you want VRR on NVIDIA it’d be cheaper to buy a freesync monitor and a little AMD card for output lol. Kyyla, green.pixel, Silent_Buddha and 1 other person like this. Are there benchmarks being done with these setups? There should be some additional latency by sending the framebuffer back from the Geforce into the PCIe bus and again through the Radeon. ToTTenTranz and pharma like this. in any case, this trick of using a weak GPU with Freesync support to output the game rendered by the geforce would be VERY interesting if Intel IGPs supported adaptive sync, but while Intel plans to support it it's not coming anytime soon. Well, for owners of NV cards, it's still cheaper to buy a cheap AMD card to pair with any of a plethora of AdaptiveSync (FreeSync) monitors AND Televisions than to buy a G-sync monitor of similar specifications. If I weren't too busy to do much gaming, much less tinkering with my PC, I'd look into buying a cheap AMD card just to try this out as I already own an AdaptiveSync monitor. In a similar way, I don't see why you couldn't use an NV card to pass through the video signal from an AMD card to a G-sync monitor, thus avoiding the vendor lock-in if you didn't want to upgrade to another NV card. Do we know it's not coming anytime soon? Chris Hook just went on record last week on saying they're still planning to support it, and I'd put my money on 10nm being the culprit here. Yes, Intel announced they intended to adopt Adaptive Sync back in 2015. That was shortly after they had introduced Gen9 with Skylake, so they were probably talking about Gen10 which was supposed to appear next year in 2016 with Cannon Lake. 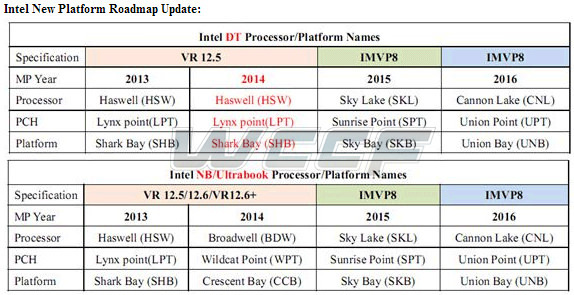 All their consumer releases have been tiny incremental updates to Skylake architecture-wise. Since 2015 they mostly decreased their profits per-waffer/mm^2 by increasing core count and L3. They can't launch the U-series 15W 2C+GT2 because those would be easily defeated by Raven Ridge and Picasso. Maybe they can use that silicon for Y-series 4.5W but Picasso might cover that TDP range with 4-cores and 8 CUs. Curiously, this last roadmap showed all Coffee Lake models coming with GT3e and that obviously didn't happen either. There's only a couple of SKUs with GT3e and those are 20-28W U-series 4-cores, not 2C+GT3e. The rest are all 2/4/6/8-cores+GT2. I guess Ryzen really did make Intel scramble their plans a lot, not just the problems with 10nm. Regardless, in 2019 we will probably see Gen10 with Adaptive Sync, and Intel's discrete graphics coming 2020 will definitely have that feature too. Ice Lake, slated for next year, already has gen 11 graphics (I'm quite certain it will be manufactured on a different 10nm process, albeit intel might well call this still just 10nm). This is pretty cool. I would do it I think. I don't game much now either, but my monitor is 12 years old, I have 2500k and a 950 so am upgrade is certainly something I have been thinking about. LinusTechTips tested this but went a little bit further - they tested also G-Sync on Radeon and it works the exact same way - just pick the right GPU for rendering and use the other one for output. What was the software that Intel bundled with z77 (and maybe other) motherboards which allowed users to connect monitors to the IGP and still gaming using descrete cards? It allowed for the use of quicksync while using an add in card, but I think it started life as the software that could split rendering across nVidia and AMD GPUs, initially with the companies PCIe bridge chip which was included on some MSI boards? If that could copy video outputs between GPU's surely someone could knock up a utility to enable this in Windows with 2 descrete cards? But like Linus said in the video, this is based on DXGI, part of DirectX, you don't need any extra hardware or software involved. Also I'm pretty sure someone tested this already to work with discrete cards too?